VILLA LUISA is a wonderful two-storey country villa for 8 people situated in the hills of Sorrento. 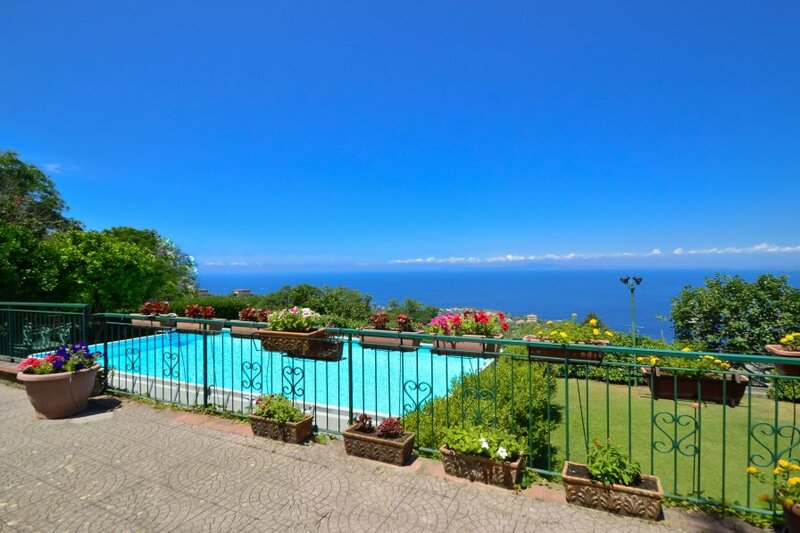 From Villa Luisa you will enjoy an amazing view of the Gulf of Naples and the sea. Villa Luisa is 130 square meters in size and comes with a private above-ground swimming pool, private sea view terraces, a private garden, parking, air conditioning (only in some rooms), heating, and Wi-Fi internet. Villa Luisa is found on the road leading from Sorrento to Sant’Agata Sui Due Golfi. It offers a spectacular view of the sea, the Gulf of Naples, and Vesuvius. The furnishings are simple and comfortable, ideal for a family holiday. You will be far away from the hustle and bustle of Sorrento, but at the same time you’ll be in a location where you can easily visit the Amalfi Coast, Naples, Capri, and Pompeii. You’ll be around 5 km from the centre of Sorrento, and about 200 metres from the SITA bus stop (the service runs between Sant’Agata Sui Due Golfi and Sorrento), and about 2 km from the centre of Sant’Agata Sui Due Golfi where you will find restaurants, shops, and the supermarket. The closest beach is about 6 km away. To stay at Villa Luisa, we recommend you come by car. You’ll be able to park in a private parking space (maximum 2 cars). You then reach Villa Luisa from the parking area by climbing five steps. The owner lives in a house next door and will be available to attend to any of your needs. The owner has their own private access to their house, so your privacy will not be invaded. THE ABOVE-GROUND SWIMMING POOL is immersed in the green of the garden and enjoys a beautiful view of the sea. It measures 11 x 5 m and is 1.5 m deep. The pool is available from 1st April until 15th October. THE PRIVATE GARDEN is around 1200 m2 in size. From here you can admire a beautiful view of the sea and the Gulf of Naples. THE FIRST TERRACE is equipped with a dining table for eight people, a sun umbrella, and three sun loungers. From the terrace you will enjoy another beautiful sea view. THE LIVING ROOM contains simple yet comfortable furnishings. Here you will find three sofas, a table with four chairs, a small television, and a coffee table. The room is fitted with air conditioning and heating. From the living room you can access the terrace with sea view. THE DINING ROOM contains a table with four chairs, and a single bed. From the dining room you can access the terrace with sea view. THE KITCHEN is equipped with a four-burner gas stove, an electric oven, a moka pot, a fridge-freezer, and other small appliances. From the kitchen you will have access to the terrace with sea view. Access to the kitchen is from the corridor. THE FIRST BEDROOM contains a double bed and is fitted with heating. Access to the bedroom is from the dining room. THE FIRST BATHROOM is fitted with a sink, toilet, shower, bidet, hairdryer, and washing machine. Access to the bathroom is from the living room. THE CORRIDOR is wide and bright. Here you will find a single bed. From the corridor you will have access to a terrace with a beautiful view of the sea. THE SECOND BEDROOM contains a double bed and has a private terrace with sea view. The room is fitted with air conditioning and heating. Access to the bedroom is from the corridor. THE THIRD BEDROOM contains two single beds and is fitted with air conditioning and heating. Access to the bedroom is from the corridor. THE SECOND BATHROOM is fitted with a sink, toilet, bath tub, and bidet. Access to the bathroom is from the corridor.